A year ago yesterday, a beloved card was taken from us. El Shaddoll Construct, the Nephilim, Mother of Shaddoll Dragons. May Konami hasten the coming of the day of her return. Now on to never-ending Raging Tempest and Book of Moon rulings. Q: A Dragoncalling Magician and Odd-Eyes Pendulum Dragon on my field are used as Fusion Materials to Fusion Summon Rune-Eyes Pendulum Dragon. During the next turn, if Book of Eclipse is activated and Rune-Eyes Pendulum Dragon is changed to face-down Defense Position, what happens to its effect that is gained from Dragoncalling Magician? Q: A Dragoncalling Magician and Xiangke Magician on my field are used as Xyz Materials to Xyz Summon Odd-Eyes Absolute Dragon. Before damage calculation while Odd-Eyes Absolute Dragon is battling a Dragon-Type monster, it Shrink is activated by targeting it, what happens to its ATK? A: In this scenario, during the Damage Step in which the 2800 ATK Odd-Eyes Absolute Dragon battles a Dragon-Type monster, the effect gained from Dragoncalling Magician is applied and its ATK becomes 5600. Once the effect of Shrink is also applied, the original ATK of Odd-Eyes Absolute Dragon becomes 1400, so the ATK is recalculated and becomes 2800. Q: My opponent activates Hammer Shot and destroys my Wind Witch – Crystal Bell, and I activate its effect targeting a Wind Witch – Winter Bell and a Wind Witch – Snow Bell in my Graveyard. If my opponent chains Ojama Trio so that I only have 1 available Monster Zone left, how does the effect of Wind Witch – Crystal Bell resolve? A: When resolving the effect of Wind Witch – Crystal Bell that was destroyed and sent to the Graveyard, if you only have 1 available Monster Zone, you will choose 1 of the 2 targeted monsters (in this case, either Wind Witch – Winter Bell or Wind Witch – Snow Bell) and Special Summon it. The monster that is Special Summoned is decided by the player who activated the effect of Wind Witch – Crystal Bell. Q: I activate the effect of Heavy-Armored Train Iron Wolf, targeting a Ruffian Railcar on my field. If Book of Moon is chained, changing Ruffian Railcar to face-down Defense Position, how does the effect of Heavy-Armored Train Iron Wolf resolve? Q: I activate the effect of Heavy-Armored Train Iron Wolf, targeting a Heavy Freight Train Derricrane on my field. After the effect resolves, if Compulsory Evacuation Device is activated and Heavy Freight Train Derricrane is returned to my hand, will my other monsters be able to attack this turn? Q: I activate the effect of Zodiac Beast Tigress, targeting a Zodiac Beast Drancia on my field and a “Zodiac Beast” monster in my Graveyard. If Book of Moon is chained, changing Zodiac Beast Drancia to face-down Defense Position, how does the effect of Zodiac Beast Tigress resolve? 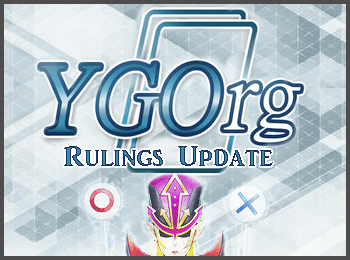 A: When resolving the effect of Zodiac Beast Tigress, if the targeted Xyz Monster on the field has been changed to face-down Defense Position, the effect cannot be applied. The targeted “Zodiac Beast” monster in your Graveyard remains there. Q: I activate the first effect of Elemental Triangle of the Zodiac Beasts, targeting a face-up Zodiac Beast Rabbina on my field. If my opponent chains Book of Moon, changing Zodiac Beast Rabbina to face-down Defense Position, how does the effect of Elemental Triangle of the Zodiac Beasts resolve? A: As in this scenario, if the face-up card targeted with the effect of Elemental Triangle of the Zodiac Beasts is changed to face-down Defense Position by the effect of Book of Moon, the effect still destroys it normally, and a “Zodiac Beast” monster is Special Summoned from the Deck. Q: When my Elemental Triangle of the Zodiac Beasts is destroyed by a card effect and sent to the Graveyard, I activate its effect that attaches it as an Xyz Material to a “Zodiac Beast” Xyz Monster on my field, targeting a face-up Zodiac Beast Bullhorn on my field. If Book of Moon is chained, changing Zodiac Beast Bullhorn to face-down Defense Position, how does the effect of Elemental Triangle of the Zodiac Beasts resolve? A: When resolving the effect of Elemental Triangle of the Zodiac Beasts that attaches it as an Xyz Material to a “Zodiac Beast” Xyz Monster on your field, if the targeted Xyz Monster has been changed to face-down Defense Position, the effect cannot be applied. Your Elemental Triangle of the Zodiac Beasts remains in the Graveyard. Q: My opponent activates Eradicator Epidemic Virus, declaring Spell. When it resolves, if an Elemental Triangle of the Zodiac Beasts in my hand is destroyed, can I activate its effect that attaches it as an Xyz Material to a “Zodiac Beast” Xyz Monster on my field? A: Even if an Elemental Triangle of the Zodiac Beasts in your hand is destroyed by the effect of Eradicator Epidemic Virus, since it was destroyed by a card effect and sent to the Graveyard, you can activate its effect that attaches it as an Xyz Material to a “Zodiac Beast” Xyz Monster on your field. Q: If Vanity’s Fiend is face-up on the field, so that neither player can Special Summon, can Interrupted Kaiju Slumber be activated? A: While the effect of Vanity’s Fiend is applying, Interrupted Kaiju Slumber cannot be activated. Q: I activated the effect of Sangan this turn and added PSY-Frame Multi-Threader to my hand. This turn, which effects of PSY-Frame Multi-Threader can I use? A: If you add PSY-Frame Multi-Threader to your hand with the effect of Sangan, since PSY-Frame Multi-Threader is treated as PSY-Frame Driver once it is in your hand or Graveyard, the effect of Sangan will prevent you from activating the effects of PSY-Frame Driver this turn. This turn, if a “PSY-Frame” card on your field would be destroyed by battle or card effect, you can still use the effect of PSY-Frame Multi-Threader that discards it instead, but you cannot activate the effect of PSY-Frame Multi-Threader that Special Summons it from your Graveyard. Q: Two copies of Zodiac Beast Thoroughblade and a Zodiac Beast Viper are used as Xyz Material to Xyz Summon Zodiac Beast Tigress, and its ATK and DEF become 4400 and 400 respectively. In this situation, Zodiac Beast Tigress attacks my opponent’s Infernoid Devyaty. If Infernoid Devyaty is destroyed by battle, but after damage calculation the effect of Zodiac Beast Tigress gained from Zodiac Beast Viper is activated, can the effect of Infernoid Devyaty that negates the activation of monster effects be used? Q: If a monster on my field is affected by Forbidden Lance, which of the effects of Chosen of Zefra will apply to it? A: The “● 3 or more” and “● 5 or more” effects of Chosen of Zefra are effects that apply to monsters, so a monster on your field that is unaffected by Trap effects because of Forbidden Lance is unaffected by them. Also, the “● 8 or more” effect of Chosen of Zefra is not an effect applied to monsters, so even if a monster on your field is unaffected by Trap effects, it still cannot be targeted by your opponent’s card effects. Q: My CXyz Skypalace Babylon that has Skypalace Gangaridai as Xyz Material attacks my opponent’s Superdreadnought Rail Cannon Gustav Max. If Superdreadnought Rail Cannon Gustav Max is destroyed by the attack and sent to the Graveyard, how does each effect of CXyz Skypalace Babylon activate and resolve? Q: A Gradius affected by Forbidden Lance is face-up on my field. If I activate Safe Zone by targeting that Gradius, which effects are applied? A: Even in this scenario, once Safe Zone resolves, it will continually target the face-up Gradius. While the effect of Forbidden Lance is applying, the targeted Gradius is unaffected by the effects that prevent it from being destroyed by battle or your opponent’s card effects and from attacking your opponent directly, and even if Safe Zone is destroyed by a card such as Mystical Space Typhoon, the targeted Gradius will not be destroyed. (However, even while the effect of Forbidden Lance is applying, the targeted monster still cannot be targeted by your opponent’s card effects.) Note that once the effect of Forbidden Lance expires, all the effects of Safe Zone will begin to apply normally.